Battery life extension is important for Windows Phone 8 devices. It is especially important for users on the go. Heavy users will find these battery life extension tips handy. Battery life extension is easy when the battery saver is on. 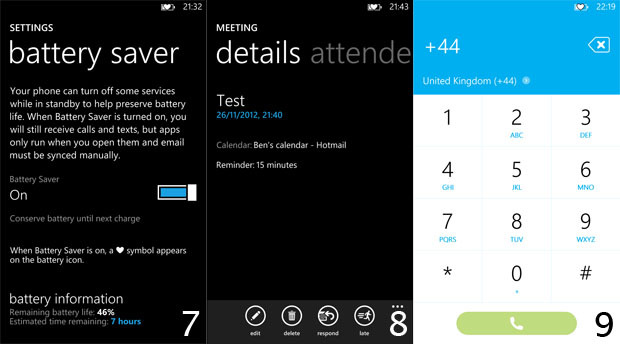 Users of Windows Phone 8 devices can find it in the Settings menu. The battery saver turns off services which are on standby. Users can still receive calls and texts. They can set the saver to one of three options provided. One is for low battery cases. Another is setting until the next charging. Users can set the always on option, but it is not recommended. Unnecessary sounds also use Windows Phone 8 devices battery charge. Turning off sounds that are not really needed is easy from the Settings menu. Users can turn off sounds for key pressing, for locking and unlocking, and for the camera shutter. For users on the go charging accessories are another way to get battery life extension. They can use portable USB chargers. There are also cases which have built in extra battery. An example of such case is the camera grip available for Nokia Lumia 1020. Yet another way to reduce battery drains is to restart the Windows Phone 8 device. If the fast draining persist, it may be time to replace the battery. For Lumia Windows Phone 8 devices there are more ways of getting battery life extension. Glance on Nokia Lumia devices enables users to see the clock and receive notification when the phone switches to standby. Users can choose Peek from the Settings menu. They should set the start and the end time for Glance. Then they get the Glance screen when putting their hand over the device. In Nokia Lumia turning off the double tap to wake up the phone also helps to achieve battery life extension. When users turn it off, they can press the power button to wake up the device.